Item is a map showing a survey of Provincial Water Grant No. 20618, in the Back Harbour of Chester, Lunenburg, Nova Scotia. The surveys were conducted on June 10th and 11th, 1954 by Errol B. Hebb of Bridgewater, Nova Scotia. 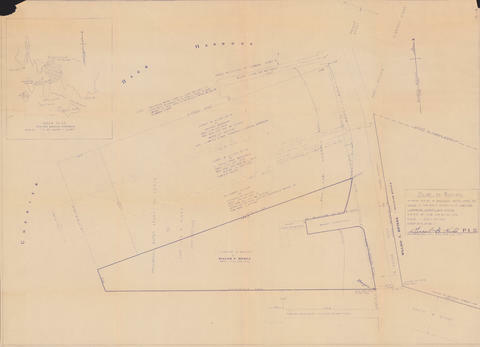 The map shows the shoreline along Shore Road, including wharves and lots currently or formerly owned by Clarissa Gibbs, James M. Allen, Andrew Anderson, C. Orchiltree MacDonald, E. R. Paxton, Elizabeth Allen, Verginia M. Allen, Mary L. Ritchie, Florence B. McCurdy, and William F. Bryans. There is also a small map of the Chester area inset in the upper left corner of the drawing.